THE public are being asked their views on plans for new cycling and walking routes linking Edinburgh’s biggest business zone with residential areas to the north and south. The city council said the West Edinburgh Link would transform cycling, walking, public spaces and accessibility in and around South Gyle and Edinburgh Park. The proposals include more than 4km of segregated cycle tracks, linking to areas like East Craigs, Sighthill and Wester Hailes, as well as Edinburgh Napier University and Edinburgh College. The council, which was awarded funding for the project two years ago, said the aim was a well-connected, people-friendly environment. And it said the plans built on responses to initial engagement with people working in the area, when 88 per cent said they supported cycling and walking improvements. Full construction is expected to start in 2021. The project will also see a new bridge built across the railway line next to Gyle Park, to create a pleasant, direct route linking South Gyle and local neighbourhoods to green spaces and workplaces. There will be traffic calming measures throughout the area, as well as of new public spaces and improvements to footpaths along the route and new road crossings as an alternative to some of the underpasses. The council won a total of £12 million of funding in 2017 for this project – then known as the West Edinburgh Active Travel Network – and another, involving a cycle link from the Meadows and George Street. The cash was from Places for Everyone, a Scottish Government-funded programme delivered by Sustrans Scotland. This map shows the whole route. 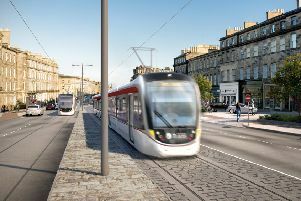 Transport and environment convener Lesley Macinnes said the West Edinburgh Link was an “essential component” of the ambition to make Edinburgh a greener, healthier and better-connected city. The drop-in events will be at: Gyle Shopping Centre, March 21, 12pm to 7pm; Westside Plaza, April 4, 12pm to 5.30pm; South Gyle Crescent, April 25, 8am-5.30pm; Gyle Shopping Centre, April 27, 10am to 4pm. People can also take part in the consultation online, which will run until May 10.